Meeting of camaraderie in Mexico In the pre-game against Tigres in Monterrey, authorities in River shared a dinner with their Mexican counterparts. 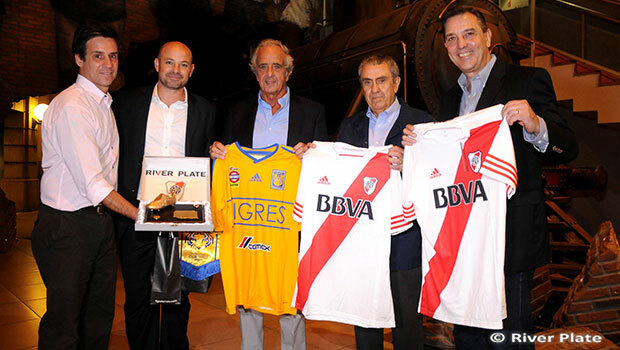 On Tuesday night in pre-match between Tigers and River Plate in the Copa Libertadores Bridgestone, authorities from both clubs met at a new meeting of camaraderie. Mexican executives had visited the "millionaires" in the River Museum, so that Argentines undertook a reciprocal gesture. The dinner, held in Monterrey, attended by the president of River, Rodolfo D"Onofrio; Eduardo Barrionuevo, Football Board member; Adrian Varela, head of Public Relations; and Daniel Mazza, Public Relation Manager, who presented a commemorative plaque and a flag. By the team of Nuevo Leon it was attended by President Alejandro Rodriguez; and Miguel Garza, Sporting Director.